One of the many areas of controversy in plesiosaur palaeobiology is the topic of how they swam. The question goes back almost 200 years to the 1820s when the first complete plesiosaurs were described from the Jurassic cliffs of Lyme Regis, UK. 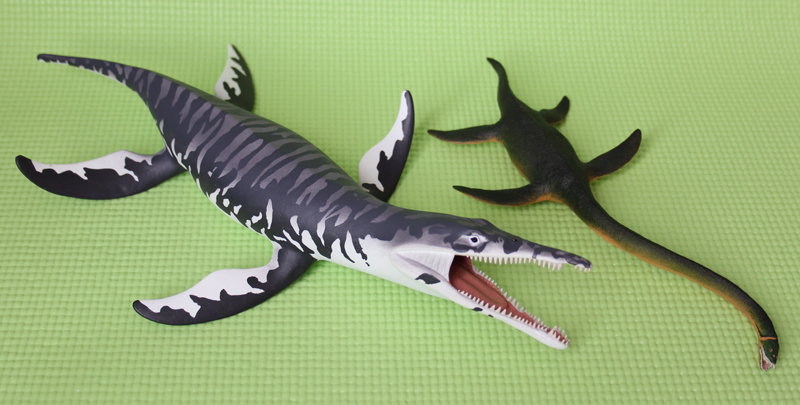 Plesiosaur swimming is a particularly difficult topic to study for a number of reasons. Plesiosaurs are extinct so there are no modern descendants, they have a unique body plan with no modern analogues, and swimming animals tend not to leave a good trace fossil record. All of this leaves us in a sticky predicament, but there are avenues we can explore to come to a greater understanding of plesiosaur locomotion. Previous researchers have tried to answer the question of how plesiosaurs swam by conducting detailed osteological analyses, while others have approached it experimentally using robotics, or humans with fabricated paddles. These studies have started to settle on some consensus but there is still some uncertainty. The topic can also be explored experimentally through computer simulation and I was fortunate enough to be involved in such a study in collaboration with colleagues at the Georgia Institute of Technology. Our findings were published today in the open access journal PLOS Computational Biology (Liu et al. 2015). 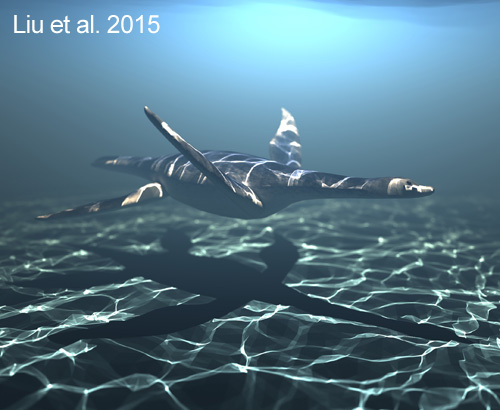 Rendering of the Meyerasaurus victor plesiosaur model used in the study by Liu et al 2015. 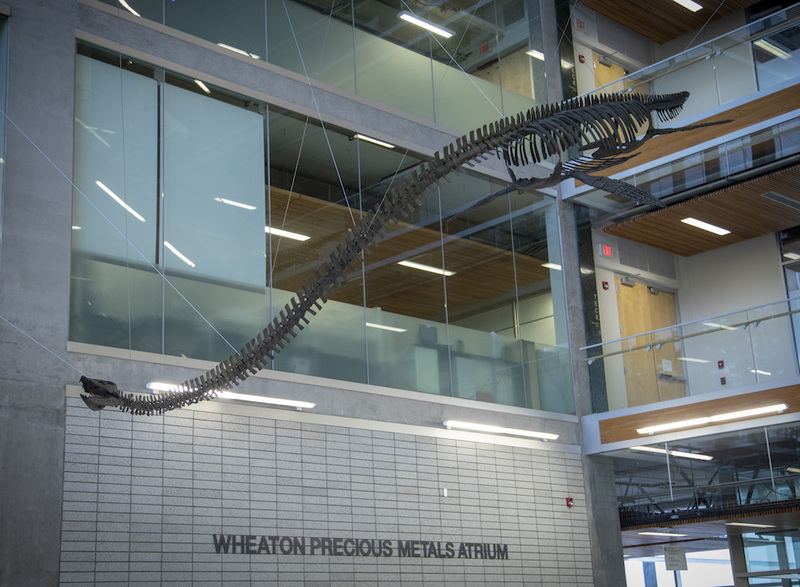 We built a full-size, 3D, virtual plesiosaur, placed it in a simulated fluid, and gave it articulated joints so that it could propel itself through the fluid. We ran thousands of simulations to find the optimal ranges of limb motion and gaits – those that moved the animal forward the furthest. We did so multiple times under different specified parameters to see how different available ranges of joint motion effected the results. To investigate the potential contribution of the different limbs, some of the simulations used all four limbs while others used the forelimbs or hind limbs only. You can check the open access paper for the technical details. We generated a lot of results in the form of videos. The simulations with the most plausible ranges of motion have a flying stroke with a large up-down component. This is essentially a form of underwater flight similar to penguins and turtles. One of the key questions we wanted to explore was how the forelimbs and hindlimbs moved relative to each other. Our results were inconsistent in this regard, which is significant in itself. The ‘forelimb-only’ simulations are just as fast as simulations using all limbs, which implies that the forelimbs were the powerhouse in plesiosaur swimming while the hindlimbs were more passive, at least during steady cruising. However, in ‘hindlimb-only’ simulations, where the hind-limbs were asked to do all of the work, the rear flippers flail around a lot but the motion isn’t transferred into thrust or forward motion. Instead, in these simulations the whole plesiosaur rocks around the centre of body mass – apparently a rear-drive plesiosaur is a no-goer. 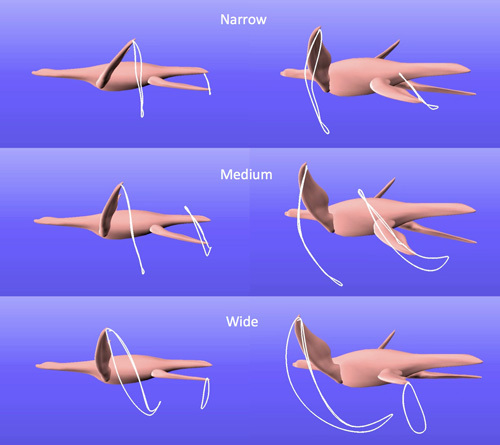 This physical constraint probably explains why no other animals have adopted this unusual body plan, and it also explains why the gait is so variable in our simulations – the hind limbs provide so little thrust during cruising that how they move relative to the forelimbs is irrelevant. An example of one of the simulations. This one shows optimal swimming in a simulation of all four limbs using the widest joint range parameters. The parameters in this particular simulation are probably beyond the biologically possible limits of the joints, but other simulations had more conservative ranges (see the paper for all the videos). To help us understand the limb strokes we traced the tips of the limbs. This one shows the limb tip traces for the above simulation, viewed posterolaterally. The hind-limbs in this simulation used only a small proportion of the available range. Out of curiosity (and not included in the paper), we also manually simulated some specific limb strokes as hypothesised by previous plesiosaur researchers: rowing, figure-of-8 flying, and modified flying. However, none of these manual simulations were as efficient as the best simulations found in our study through optimisation. Can we be sure that the method works and how do we know? Without a time machine we can never be completely certain that simulations of extinct organisms are correct. However, we can test the methods by applying them to models of animals for which their swimming is already known. In this case, our method was applied to several modern day animals including a turtle, a fish, and a frog (Tan et al. 2011). In each modern day animal the simulations were consistent with the biological reality, which suggests that the virtual reality is mirroring actual reality. This gives us confidence in our method. Our simulations may shed light onto some old questions, but they raise new ones. If the hind limbs weren’t used for steady swimming, why are they so similar in shape and size to the forelimbs? Our study focussed entirely on propulsion but not on steering or stability, so we suggest that the hindlimbs may have helped the animal change direction more efficiently. Another alternative is that the rear flippers may not have been used in steady cruising – the sort of swimming our method focussed on – but may have instead been used for sudden short-lived bursts of speed. This sort of behaviour would be unstable over long distances (and so our method would reject it), but the hind flippers may have helped the plesiosaur lunge at prey or avoid a larger predator. Tip-traces of the most efficient limb strokes resulting from simulations with all four limbs. The top simulation explored a narrow range of available motion, the middle simulation explored a medium range of available motion, and the bottom simulation explored a wide range of available motion (probably exceeding the biological limits of joint motion). We hope to explore the above questions about the function of the hind limbs in the future. There’s plenty of scope for other related studies on different plesiosaurs or other extinct swimming animals. For example, we selected a plesiosaur with a generalised morphotype for this study, but plesiosaurs as a group are highly variable. We’d like to look at some of the more extreme morphotypes in the future, the long-necked elasmosaurids and short-necked pliosaurids, to see how the proportions of the body impact the simulations. We also focussed all of our attention (and computing power) on how the limbs move, because that was our main focus. However, we acknowledge that the tail and neck may also have been important in locomotion. This is something else we hope to explore in the future. In the meantime, every journey must start with a first step, or – in this case – a first flap. Tan J., Gu Y., Turk G., and Liu C. K. 2011. Articulated swimming creatures. ACM Transactions on Graphics, 30(4), 58:1–58:12. Great article! The semi-recent release of Ark: Survival Evolved had me thinking about plesiosaur biology recently, and I stumbled on your site and it looks like you have a good practical sense of plesiosaurs. I was wondering if I could possibly get an opinion regarding the locomotion of plesiosaurs- Their flippers are of course their own debate, but I was wondering what the abdomen is doing while the flippers are moving, if that makes sense. Is the spine fused as to make the back of a plesiosaur rigid and straight like birds? Does it move side to side like mosasaurs, crocodiles, and so on? Could this contribute to its locomotion? I can’t imagine a cetacean vertical swimming motion for them, but that’s speaking from only knowing about the spinal arrangements and locomotion patterns of modern reptiles, what seems to be evident for mosasaurs and their kind, and birds. Thanks for the question! The spine isn’t fused in plesiosaurs but the torso was rigid indeed. This is due to the vertebrae articulating tightly, large flat plate-like shoulder and pelvic girdles, and a tight mesh of gastralia (belly ribs), all of which inhibit motion. So, the torso was almost completely immobile in plesiosaurs and certainly didn’t contribute towards swimming. Functionally, plesiosaurs were most like turtles and penguins, which also have very restricted torsos. Almost all the thrust came from the flippers. 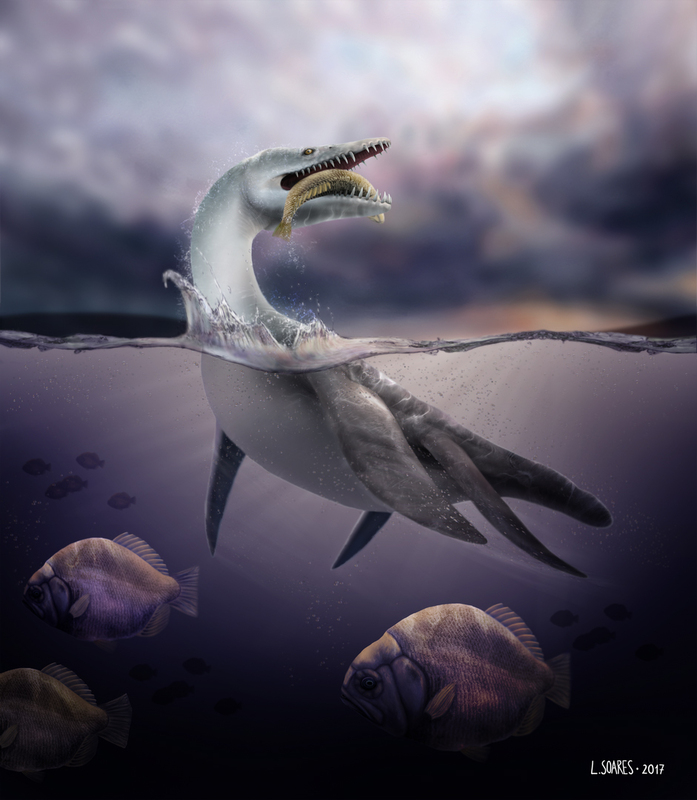 Perhaps the tail contributed in plesiosaur swimming too, but only minimally.